Advanced Cognitive Technologies can use cognitive architectures as a basis for higher level reasoning in Artificial Intelligence (AI). 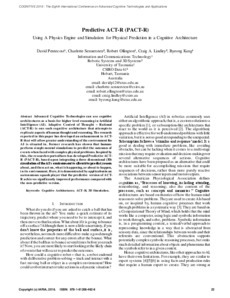 Adaptive Control of Thought – Rational (ACT-R) is one such cognitive architecture that attempts to replicate aspects of human thought and reasoning. The research reported in this paper has developed an enhancement to ACT-R that will allow greater understanding of the environment the AI is situated in. Former research has shown that humans perform simple mental simulations to predict the outcomes of events when faced with complex physical problems. Inspired by this, the research reported here has developed Predictive ACT-R (PACT-R), based upon integrating a three dimensional (3D) simulation of the AI’s environment to allow it to predict, reason about, and then act on, what is happening, or about to happen, in its environment. Here, it is demonstrated by application in an autonomous squash player that the predictive version of ACT-R achieves significantly improved performance compared with the non-predictive version.